I am not that kind of doctor, but a philosophiae doctor (Ph.d.) in biology. As for other kind of exams there are people coming from other universities to evaluate the performance. The assessment committee consists of the two opponents, and an internal professor, which is not the candidates’ supervisors. The assessment committee first have to approve the thesis for the defense, and then they can approve the defense as the final step. 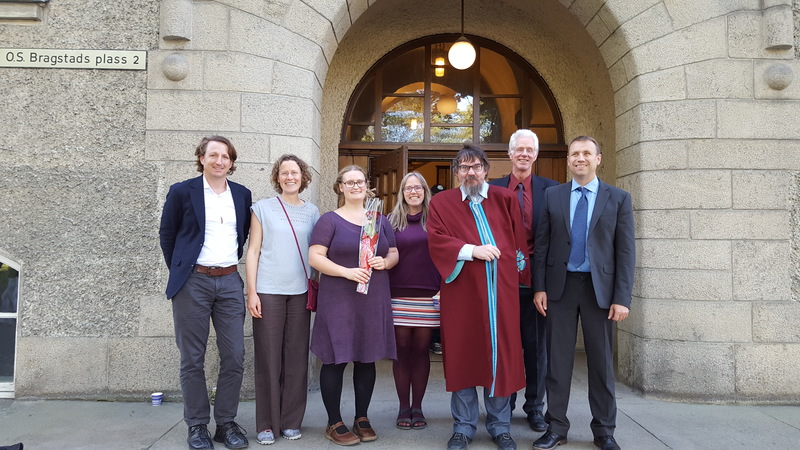 The defense of the PhD title has two steps in Norway, and it primarily for the opponents, but also for the public. First, you have to do a trial lecture in the morning. I had 10 working days up to the defense, to prepare a 45 min lecture with the title “The Global Carbon Cycle in a changing climate”. The topic should be related to the thesis work, but still not the same as your topic. Then in the afternoon, you make a lecture about your PhD findings (45 min), and this lecture is followed by 2-3 hours questioning/discussion afterwards. Even though that program seems like a marathon, those final weeks are only a symbol of the work that I have done, and the product is a 200-page thesis including four papers (two of them are published, I write about the most recent one here and the one that came out in 2017 here). It is only a symbol, because within the past five years I have done a lot of things; I have been teaching 1680 hours (corresponding to 1 year), I have worked in the field for three summers, I have worked endless hours in the lab, I have processed data and results, programmed code in R, I have been writing proposals, I have been writing papers, taken several different courses, I had two research stays in Arizona, and much more. I was supposed to have done all this in four years, but then I was so lucky to become a mother as well. I was very fortunate to have the chance to make a PhD in Norway. When I started my PhD I was sure that the family expansion should come afterwards due to the work load a PhD takes. And it was a mystery to me why so many of my female PhD colleagues became mothers during their PhD. 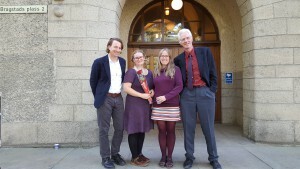 But I was positively surprised about the opportunities there are in Norway that supports a mother to pursue a career. I am Danish and while living in Norway I always compare Norway and Denmark, which are both Scandinavian countries that are similar in many ways. I will say in relation to this issue of being a mother pursuing a career, I think Norway is doing better than any country I know of, also Denmark. In Norway, having a child does not affect your income, other than the expenses you have on the child itself. All of the Scandinavian countries have a long maternity leave (9-12 months) and this is the first step towards really good conditions. In Norway, you get full salary during this time (unless you choose to get 80 % salary and stretch the leave for a longer period). During the pregnancy, everybody knows that stress is bad for the baby, both physical stress but also psychological stress. Normally you have to call in sick during the pregnancy if you are not able to work during that time, or if you need to work less. In Norway, they have a system supporting leave from work during the pregnancy called “Svangerskapspenger”, when your condition is damaging for the baby. When coming back to work after the maternity leave, the baby is often around 10 months. 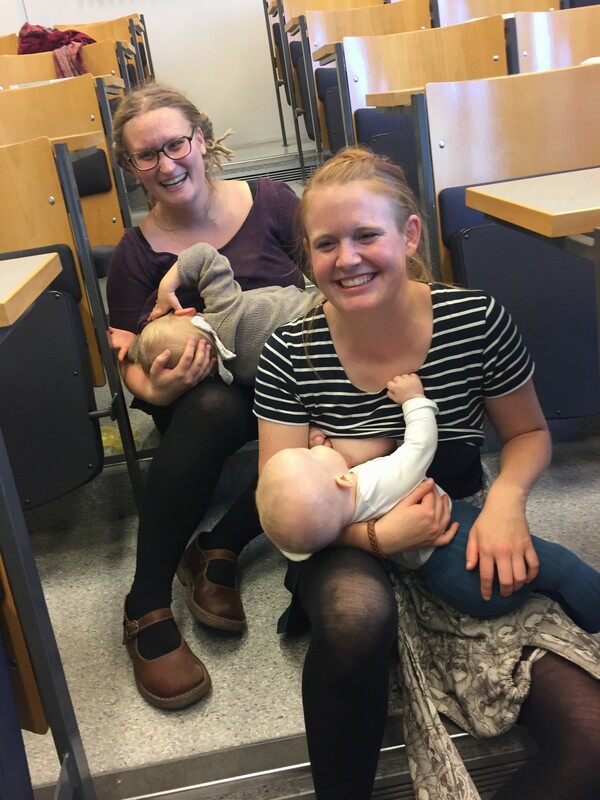 In Norway they strongly recommend to breastfeed your child until it is 1 year old, and WHO recommends to continue to at least 2 year. But getting back into a job with long working hours is really hard if you have to continue with breastfeeding. In Norway they therefore have this thing called “Ammefri”. You get up to two hours from your working hours to breastfeed your child until the age of two years. Some work places have this until the child is one year (paid, unpaid is still a right), in the university it is until the child is two years (paid). I really wish that more countries will go Norwegian style in these matters. So here I am, I am a mother and a PhD, and I am grateful that living in Norway gave me those opportunities. Now we are soon moving on to new adventures in Denmark.